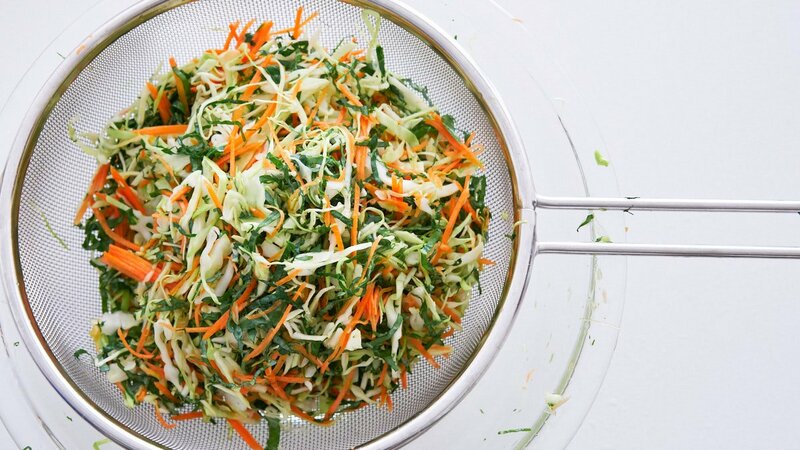 If you're looking for a lighter alternative to the classic, this healthy no-mayo coleslaw makes for the perfect side to bring to a summer BBQ or potluck. 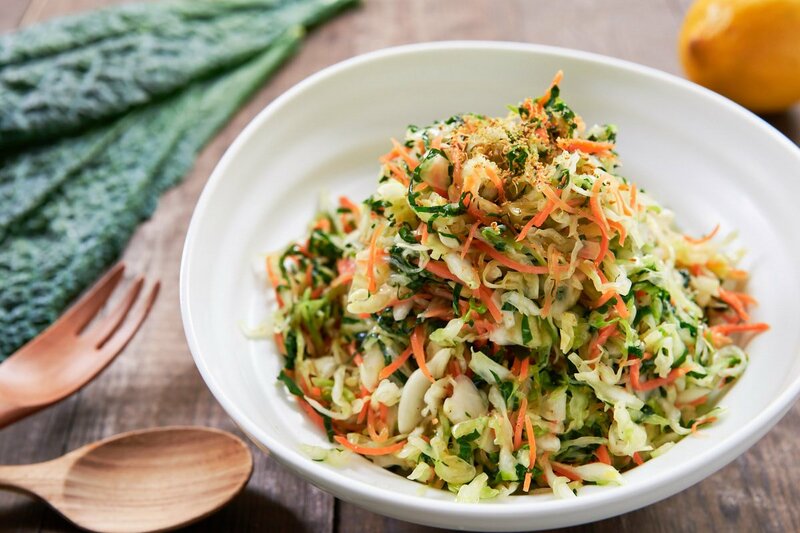 Dressed with a refreshing lemon and olive oil dressing, this colorful slaw is loaded with carrots and kale for their vibrant color and boost of nutrients. Coleslaw is the English transliteration of the Dutch dish koolsla, which literally means “cabbage salad.” Its earliest recorded appearance on the American culinary scene was about 250 years ago in the cookbook The Sensible Cook: Dutch Foodways in the Old and New World, but there are similar salads made around the world. In addition to the usual cabbage and carrots, I like adding a bit of kale to my coleslaw. This not only gives the slaw some vibrant green highlights, but it also adds a wonderful mustardy flavor, while giving the salad a boost in Vitamins A, C, and K.
Although it may not seem like, it cabbage is made of about 93% water, which explains why coleslaw quickly turns into a watery mess by the time it’s served. To get around this, I like to salt the vegetables in advance, which allows the excess water to drain out of them, so when you combine them with the dressing, you end up with a well-seasoned salad instead of a soup. Because the coleslaw won’t get water, you can also make this dish up to a day in advance! While there’s a time and place for mayonnaise, it’s my opinion that there’s no place for mayo in slaw. As a side salad, coleslaw is supposed to contrast heavy meat-based dishes such as barbecue and fried chicken. Instead, the mayo makes the salad rich and cloying, which just compounds the greasiness of the food with which it’s served. This is probably why many cooks add a ton of sugar to their coleslaw so that it’s able to serve as a sweet counterpoint to more savory dishes. For me, the only thing that traditional coleslaw contributes to a meal is a lot of extra cholesterol. That’s why I’ve kicked mayo to the curb for my take, opting instead for a light lemon and olive oil dressing that turns this classic into a fantastic palate-cleansing side for a summer barbecue. If you’re of the school that believes it’s not coleslaw if it’s not creamy, give this a try this with a tablespoon or two of Greek yogurt added to the dressing. 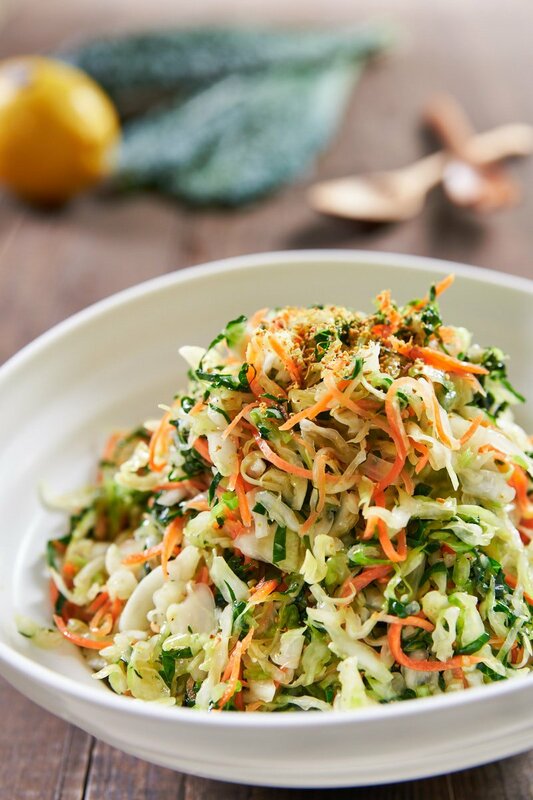 I love the mild anise flavor of fennel pollen, and by adding a pinch to my coleslaw, it takes it from a refreshing side to a wonderful accent that makes the flavors of the main dish pop. 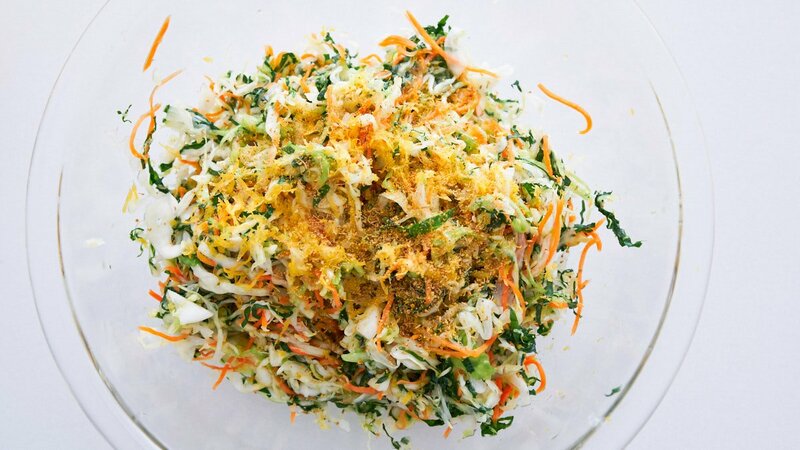 If you don’t have (or don’t like) fennel pollen, celery seed, or caraway seeds are also wonderful additions to this slaw. 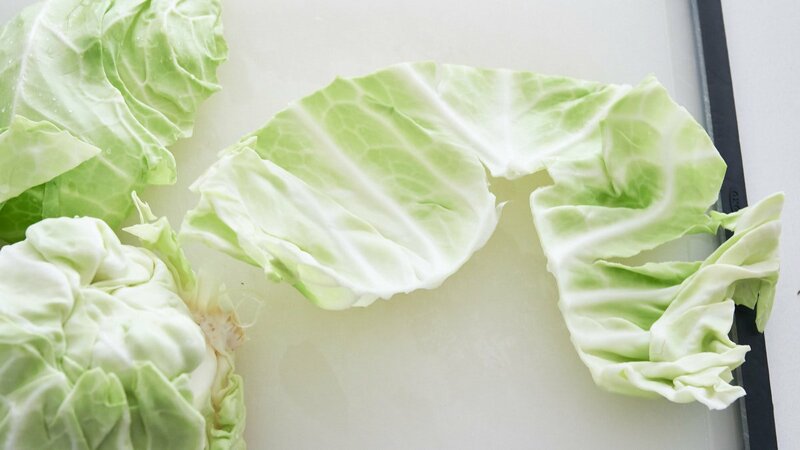 Remove any tough, or discolored outer leaves from the cabbage and discard. Peel off the cabbage leaves from the head, trimming out the tough center stems as you go. Stack the cabbage leaves and cut them into thin ribbons. 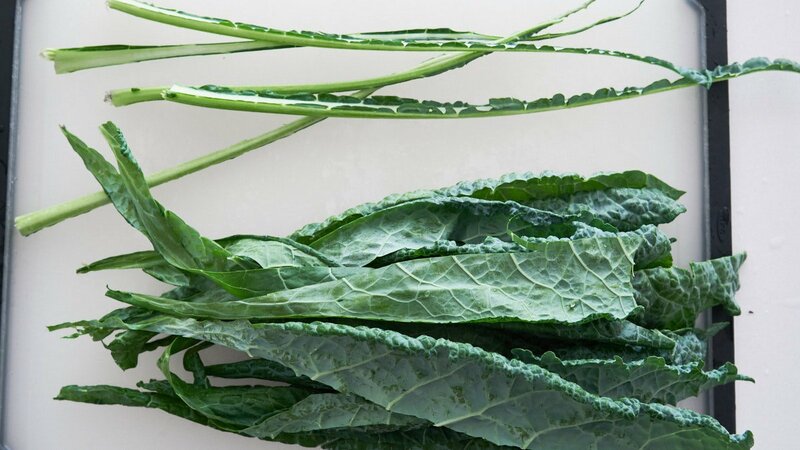 Remove the center rib from the kale, stack and cut the kale into thin ribbons. Add the cabbage, kale, and carrots to a bowl and toss with about 1 teaspoon of salt. Transfer to a wire mesh strainer and let this drain for about 10 minutes. In a separate bowl, zest half the lemon using a Microplane and then juice the lemon (you want about 2 tablespoons of lemon juice) into the bowl with the zest. Add the olive oil, 1/4 teaspoon of salt, fennel pollen, and black pepper to the dressing and whisk to combine. Give the cabbage mixture a light squeeze and add it to the bowl with the dressing. Toss to coat evenly.